The institute offers undergraduate, postgraduate and doctoral programs in the areas of greatest demand and scope, with a student centric environment. The modern state-of-the-art facilities are developed to provide a conducive atmosphere for Teaching, Learning and All-Round Development of the students. MPSTME offers Engineering and Technology management programs at its Mumbai and Shirpur campuses. Hostel facilities with all modern amenities are available for boys and girls at both campuses. Mukesh Patel School of Technology Management & Engineering (MPSTME) is the important addition to NMIMS’ vision of ‘Transcending Horizons’. MPSTME leverages the capabilities inherent in the university, in both engineering and management domains to make this unique contribution possible. 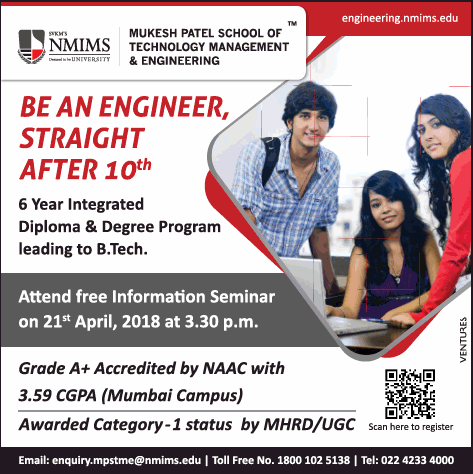 Mukesh Patel School of Technology Management & Engineering (MPSTME) is an important addition to NMIMS's vision of "Transcending Horizons". MPSTME came into existence under the able guidance of Shri Amrish Patel along with few technocrats with a dream of fulfilling the requirement of both Engineering and Management. In the year 2006, MPSTME came into existence with the entry of the third batch of MBA (Tech.) innovative program which was started in the year 2004. MPSTME campus in Mumbai stands tall as a shining metaphor of India's progress in the field of education. MPSTME came into existence in 2006-07 with the entry of the third batch of MBA (Tech.) innovative program started in 2004. MPSTME campus in Mumbai stands tall as a shining metaphor of India’s progress in the field of education.